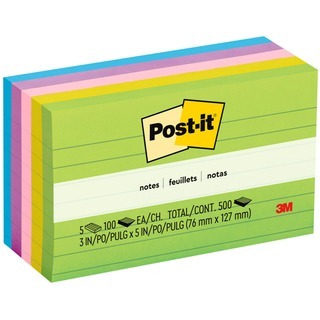 The original Post-it Notes with lines keep notes neat and organized. Self-stick, removable notes stick securely and remove cleanly. Keep information organized and at your fingertips with the 3" x 5" size that allows more space to write. The Jaipur Color Collection with emotive colors draws upon the food, art and culture of India. Post-it Notes are recyclable, and the paper in Post-it Notes is sourced from certified, renewable and responsibly managed forests.